Limb Trauma and Lymphoedema Research Wins Acclaim. 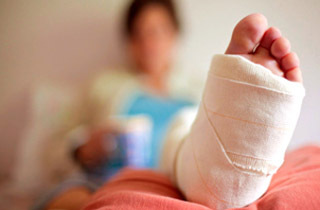 Lymphoedema can manifest following severe trauma to a limb such as a road accident or fall. Flinders University phD student Malou van Zanten won presenter of the day award at the 6th International Lymphoedema Framework Conference held in Glasgow in June for her work in this area. Her research examines the impact of severe lower leg trauma and subsequent soft tissue damage on the lymphatic system, particularly injuries that require tissue reconstruction. Her methods include a unique imaging technique developed by Flinders Medical Centre’s Biomedical Engineering Research and Development Group to analyse how the lymph vessels function near the reconstructed area in real-time.